What do people think? Anyone used it? Another heavy piece of evolution that will disappear? Just one more piece of expensive gear I'll never use? How did we ever climb without it? My main concern would be maintenance & hard to reach bolts - this essentially shortens your biner-reach to normal arm stretch. And my baby likes to chew on draws, this one looks like it bites back! That video really sells steve haston acting skills. I just want him to point to a bolt, piton and icescrew in slow motion again for me, I didn't quite get what they were. In the text he explains that the video is a bit weird so they didn't have to do as many translations. >to do as many translations. But it doesn't explain why there were no close ups or in-situ footage. Just him clipping again and again for 5 minutes. Also doesn't show how to clean gear - how easy is it to remove for the second? I give the ad 1.5 stars. How about you Margaret? All of the "problems" illustrated in the video are also solved with locking biners, and I'm not keen to making every clipping task twice as difficult. Meh. See! That ad is SO much more entertaining (if completely ridiculous) - and you can actually see how the biner works. Shame that it seems very likely to get damaged and/or filthy with a low lifespan. I give the ad 4 stars, over to you Margaret. Very large carabiner for belaying with Munter hitch and for rappelling, with single or double ropes. 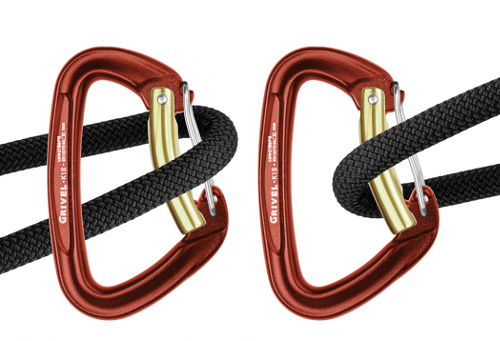 Carabiners clip and unclip by accident, unclipping can cause injury, death, and huge inconvenience, the only carabineer that successfully cures this, is the Twin Gate. Check it out, accidental unclipping seriously compromises longevity! Twin gate, two gates, twice the carabiner. There are also neat things such as the Rock Exotica Bi-wire. These are a great where you might otherwise use screwgates in your anchor system. If you fall on the non-gate side of a biner is this really an issue? >If you fall on the non-gate side of a biner is this really an issue? I imagine not. However, gate-flutter while the rope whipping through it during a fall is a known event, and on rare instances has caused unclipping issues. I also imagine that if a rope manages to pass a fluttering internal gate, then the outside gate which opens outward, would not prevent that rare unclip to happen? Noted that too, along with the spelling of carabineer (sic). I like the cheapo idea of adding two biners facing opposite directions on a bunny earred knot on the end of a sling, with another biner on the end (obviously). Though, they do look so nice and Ironman-esque. >Noted that too, along with the spelling of carabineer (sic).